I was going to dedicate this month to providing feedback from users but I have had so many questions with the format change that I thought I would address those first. As you may remember, courses were broken out into six-month segments for new hires, but I received so much feedback of “I can’t find the course I want” or “We only do residential” or “We just want our employees to take a few courses in each segment,” that I listened. As a result, we no longer have the six-month segments listed. Instead, every course is listed individually. Even though courses are listed individually, that doesn’t mean that we aren’t offering you some direction on which courses to take or tell your employees to take. There are actually three ways to find courses. 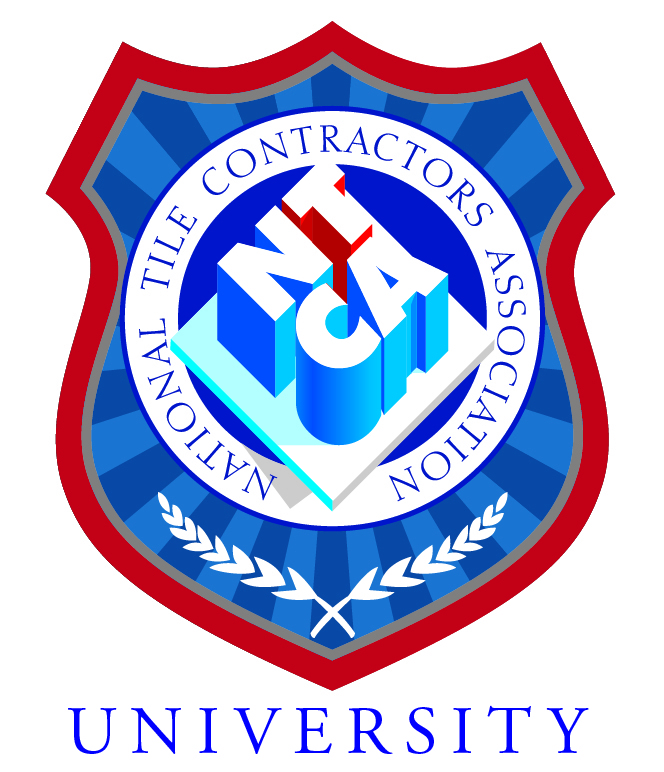 Let’s assume that you are a tile installer with a new hire; you can click on the introductory courses on the home-page of NTCA University. This opens into an Excel spreadsheet and lists all of the courses in six-month segments. You can then tell your new hire to follow the courses as listed or move courses around or delete courses that may not pertain to your company. And as new introductory tile setter courses are added, they will be added to this spreadsheet. The other two ways to find courses can be found on the subscription tab. The first is a keyword search. So if a word is in the title of the courses, description, or keywords then it will appear. All courses have keywords associated with them that you can do a search on to see what is available. For example, if you search for grout, you will find several different grout courses, then you can scroll through and find the type of grout you wanted to learn about. The third way to find courses is by clicking on a category. For example, if you are a beginner tile installer, you can click on “beginner” and all courses that have been tagged will be listed. Then you can decide what you would like to take. Or if there is a management course that you would like to take, click on the type of course and if one is available it will be listed. To purchase your subscription, you can visit the NTCA store at https://tile-assn.site-ym.com/store/ListProducts.aspx?catid=490398 or http://bit.ly/2taYmOO to make your purchase. If you have any questions or have ideas of courses that we should have available then please give me a call or send me an e-mail: 770-366-2566 or [email protected]. This document basically says we are to center and balance the area to be tiled, while both minimizing the amount of cuts and maximizing their size. Fundamentally these are the rules we follow, but in their definition and execution it can get quite subjective. Having spent the vast majority of my career in the high-end residential market, some of my opinions may differ from someone in the commercial side of the business. That being said I feel pretty fortunate to have had a mentor who took extreme pride in layout and instilled the same in me. While maybe only other craftspeople and design professionals will truly appreciate all the thought and effort put into a great layout, I think everyone can feel the difference between a chopped up space and one that flows. If you don’t take the time to really think it through and begin with a clear vision of the finished project, you will make mistakes and have some uncomfortable conversations with your clients. 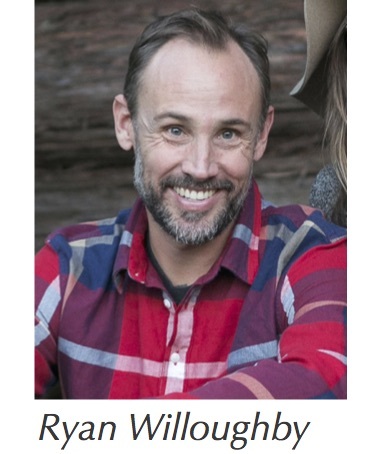 Besides being able to share my philosophies on layout, writing this article gave me an excuse to reach out and discuss the subject with someone I’ve watched on social media, the NTCA’s Oregon State Ambassador, Jason McDaniel. Jason has a really cool and unique approach to laying out some of his installs, but first I’ll walk you through my process and then share a bit from our conversation. My first course of action is to familiarize or re-familiarize myself with any detailed drawings for the project and identify what the architect or designer’s vision for the space is. Next, I’d square up the space and locate any problem areas that will need to be discussed or fixed prior to install, such as an out-of-square room, or my wall tile tying into an out-of-plumb or level surface. Putting up perfectly plumb and level grids really accentuates these problems, and the smaller the tile, the more obvious it is. Someone may have a hard time seeing a 3/8” taper in a 24”x 24”, but it’s an entirely different story over the same distance with a 5/8” mosaic. If you’re going to be tiling a shower to the ceiling, you need to know if the ceiling is 3/4” out of level across the back wall. On floors, I snap a reference line off my longest or most visual run and find square from that by using “3-4-5” also known – to the more academic among us – as Pythagorean theorem. To be honest, these days I just use a laser square; it speeds up the whole process. On walls it’s the same; find center, then plumb and level with either a spirit/bubble level or a laser. 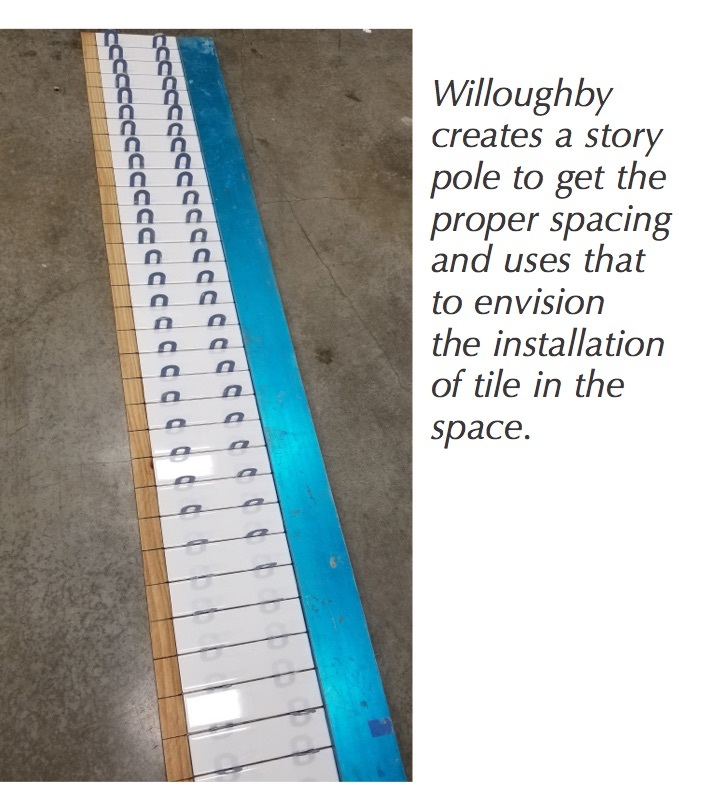 With mosaics, make a true story pole marking a piece of lumber at each joint. Once I have all this information it’s envisioning the space and identifying the most visual areas. Do you want to “center” or “balance”? For floors: do I center the room itself, a threshold or hall, a kitchen island, a soaking tub, the shower, toilet? For walls: is it the space, a window, plumbing, start full here or there? The biggest mistake I see people making is getting locked into their first choice and not weighing all their options or passing on that opportunity to be awesome in lieu of saving 15 minutes. I’ve found making these suggestions to an architect or designer is typically welcome and appreciated. With the advancement of manufacturing technology we’ve seen all sorts of new shapes and patterned mosaic sheets become readily available. These more elaborate patterns can make it difficult to see what every cut will look like on a kitchen splash with multiple stopping points. 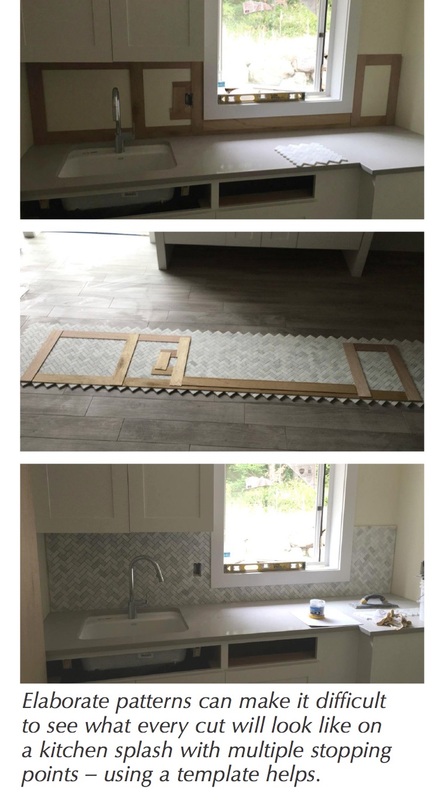 I saw Jason McDaniel of Stoneman Construction, LLC in Lake Oswego, Ore., making templates for these installs and thought it was a great idea. I gave him a call to talk to him about it. Jason has a background in solid surfaces and was comfortable with making templates. 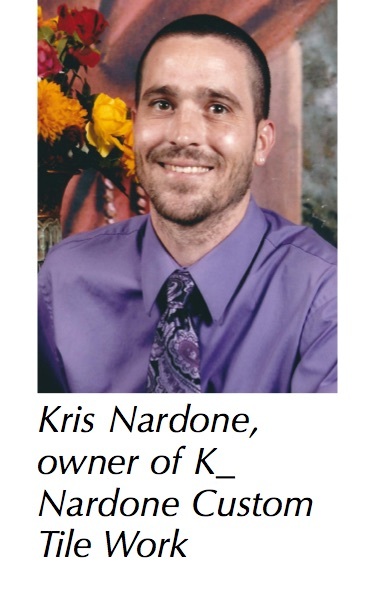 The first time he tried it on a tile install was while working on a large project, a beautiful home where he had already completed four bathrooms. He came to a backsplash that had many things to consider: a window, cabinets, and multiple outlets. 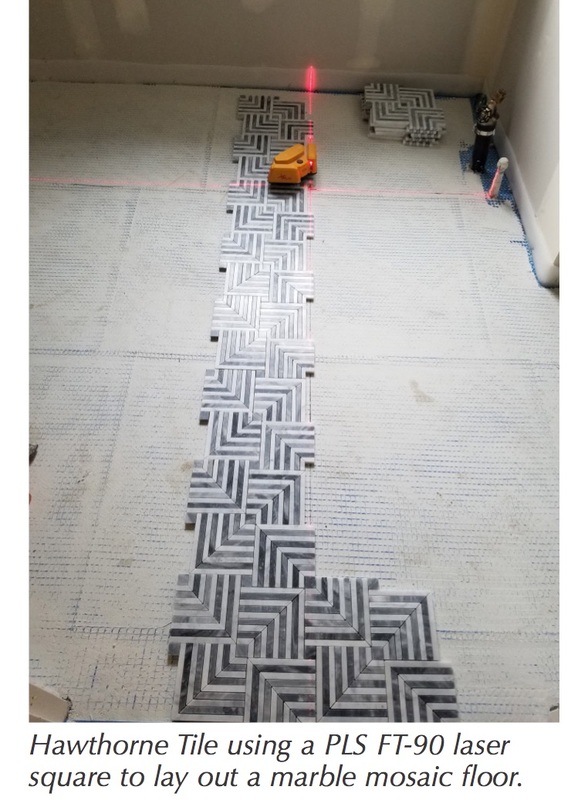 He was setting a 1” x 3” marble herringbone mosaic. He looked over the space wondering where to start. That’s when it hit him – he made a quick template, laid the tile on the floor, was able to lay the template over the tile, and quickly see everything. 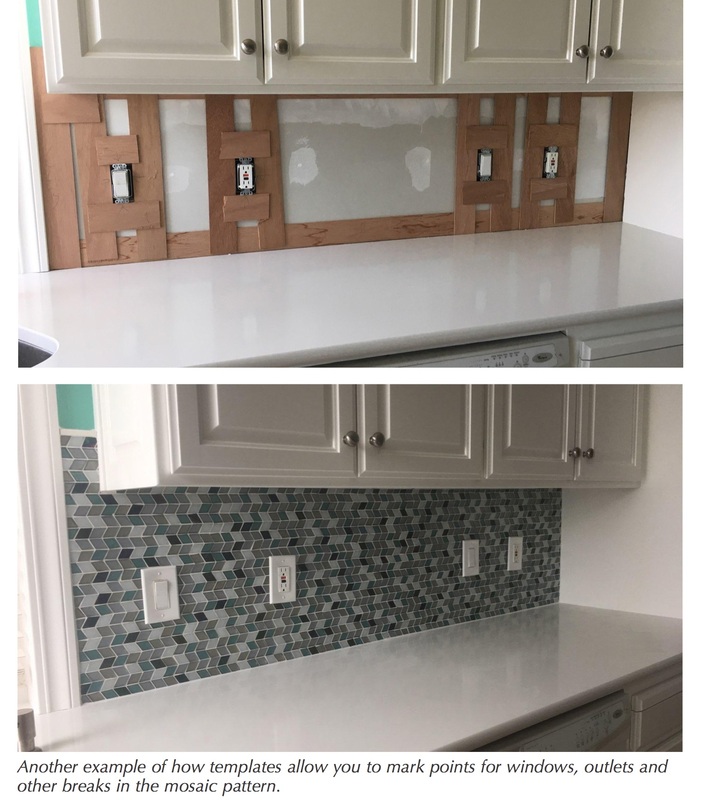 He marked all his cuts, made his cuts, and had the backsplash set within a couple of hours. He saw in that moment that this was going to be something he’d be doing much more of in the future. Jason shared with me other installs where this method really shines, like installing water-sensitive stones with epoxy or a rapid-setting thinset. You don’t have to stop to take a measurement or go to the saw – just comb and go. 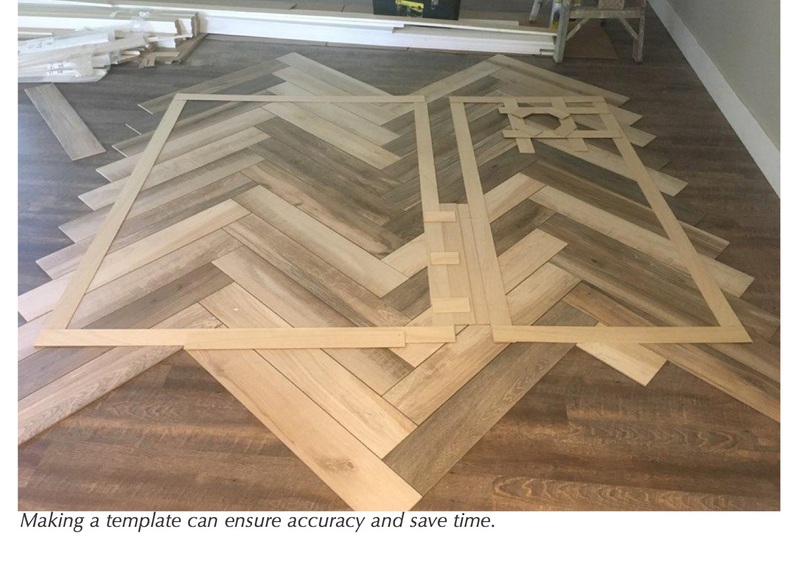 Or when stopping by a job on your way home, you can make a quick template, lay out the tile at your shop the next morning, make all your cuts, and hand them off to your installer. When I asked Jason if he had any advice, he said, “’Centered’ and ‘balanced’ are the terms most often heard when talking about layout. I lean more towards ‘balanced’ when laying out a space. Balanced doesn’t always equal centered, especially with all the different shapes and sizes of product we are seeing these days.” I couldn’t agree more. 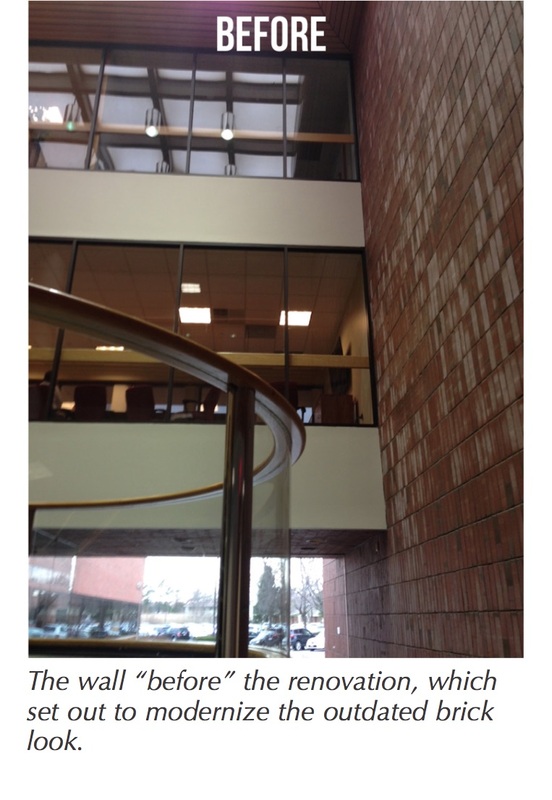 Constructed in 1982, Lexington Office Park’s lobby was badly in need of a fresh look. A Class A office building located only 11 miles outside Boston, Lexington Office Park has much to offer potential tenants, and the 82,000 sq. ft. of interior space is just the beginning. The campus also includes a wooded lot with a pond, plenty of parking, an in-house café, a conference area, and a fitness center. However, the outdated lobby fell short in offering a fitting first impression for such an exceptional facility. CUBE 3 Studio was retained to lead the renovation and transform the lobby into a welcoming, modern space. It would be no small feat as there was a three-story brick structure that ran on both the interior and exterior of the lobby. The configuration imparted a look more “old library” than “upscale corporate,” but because of its position, it could not be demolished and removed. 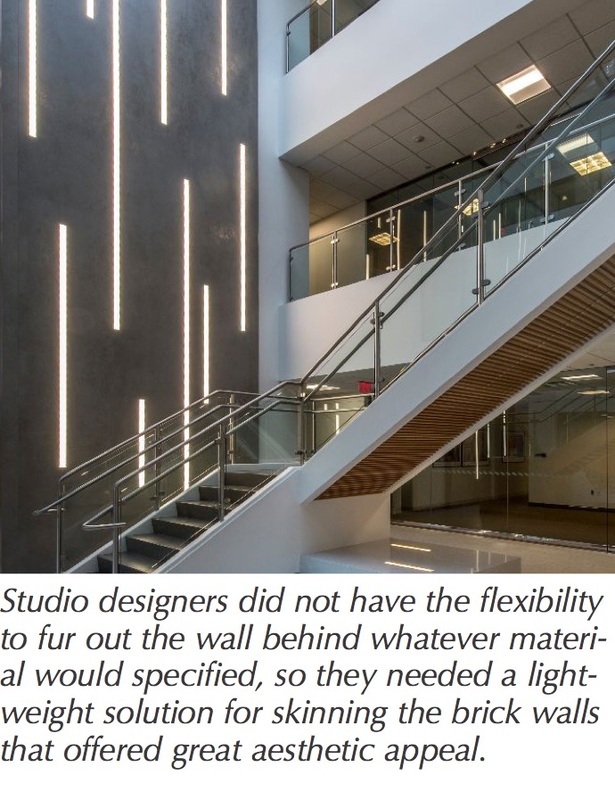 Members of the CUBE 3 Studio team would have to work around this element, and they knew material selection would have to be the answer to this challenging design dilemma. They set out in search of a durable surface that could somehow mask the dated brick while also spanning the height of the lobby without getting lost in the vast space. Also – because the exterior wall system was the only break between the brick that ran from the interior to the exterior, the CUBE 3 Studio designers did not have the flexibility to fur out the wall behind whatever material would specified. They needed to identify a solution for skinning the brick walls – something relatively lightweight with great aesthetic appeal. 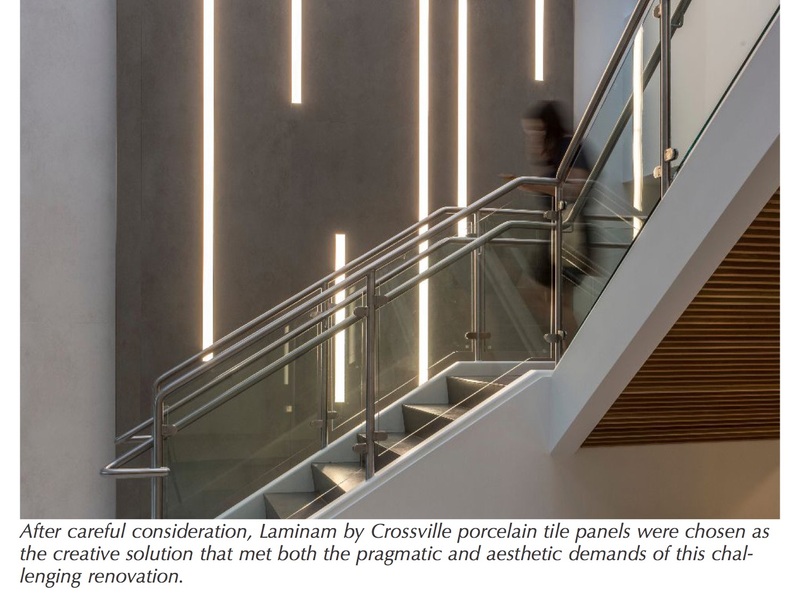 After careful consideration, they selected Laminam by Crossville porcelain tile panels as the creative solution that met both the pragmatic and aesthetic demands of this challenging renovation. Laminam collections provided the right installation advantages, technical characteristics, and a sleek, modern look befitting of Lexington Office Park’s amenities. For the walls, the team chose Laminam Oxide in the Bianco and Grigio colorways. With its grit-and-glitter industrial style, the Oxide collection provides the large-scale contemporary aesthetic that the design team was seeking, with no need for demolition or complicated preparation prior to installation. Ultimately, the general contractor, Bowdoin Construction Corp., chose to sheet rock over the brick and then install the Laminam. 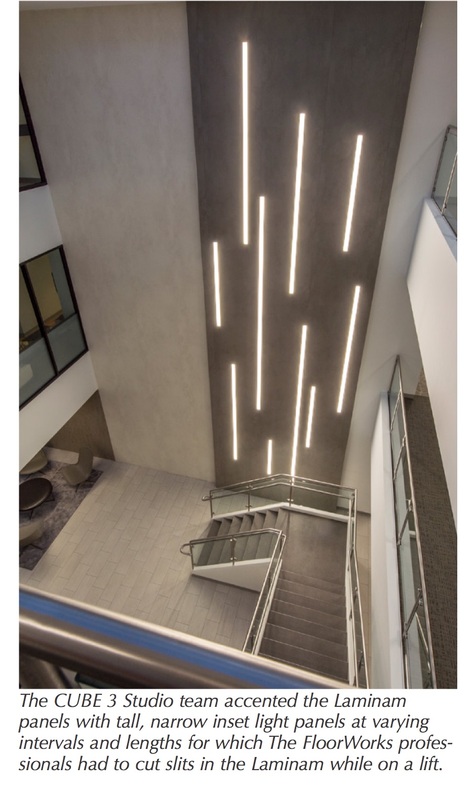 Laminam Oxide Bianco, the primary tile in the space, lightens and brightens the previously dark lobby, while a large, vertical swath of Grigio, placed at the entry to the open stairwell, pulls the eye up the three-story space with a dramatic flourish. To further emphasize the height, the CUBE 3 Studio team accented the Grigio panels with tall, narrow inset light panels at varying intervals and lengths. These insets add dimension and interest. 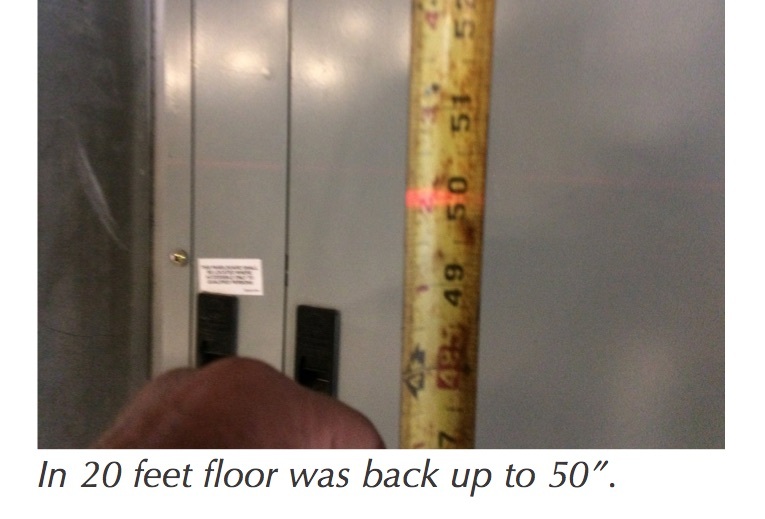 To achieve the design, the installation professionals with Floor Works had to cut slits in the Laminam while on a lift – a unique challenge that they skillfully managed. The resulting effect proves to be well worth the effort. On the stairs, earthy and elegant Laminam Fokos Roccia was installed directly over existing materials – no demo required. The sturdy profile of the 5.6mm-thick material will withstand years of foot traffic beautifully. 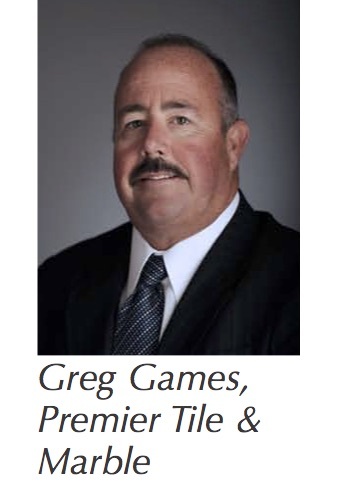 Premier Tile & Marble, Gardena, Calif.
Greg Games, the owner and president of Premier Tile, began his career in the tile industry in the late 70s working for his father, Ray Games. The senior Games owned Orange County Tile, which focused on residential tile installation. Greg Games joined the union and became a journeyman in 1982 while working for Venetian Tile. Soon, he began estimating and eventually became vice president until its owner retired. In 1993, Premier Tile & Marble (www.PremierTile.com) was established in Gardena, Calif., with many field and office employees who had worked together for many years. This family-run business prides itself on employing second and third generations of highly-trained craftsmen, who have helped build Premier Tile into one of Southern California’s leading commercial tile installers. 2018 marks Premier Tile’s 25th year providing the highest-quality commercial tile and stone installation that clients have come to expect. The company’s reputation in the industry comes from its dedication to professionalism and strict adherence to the highest standards. 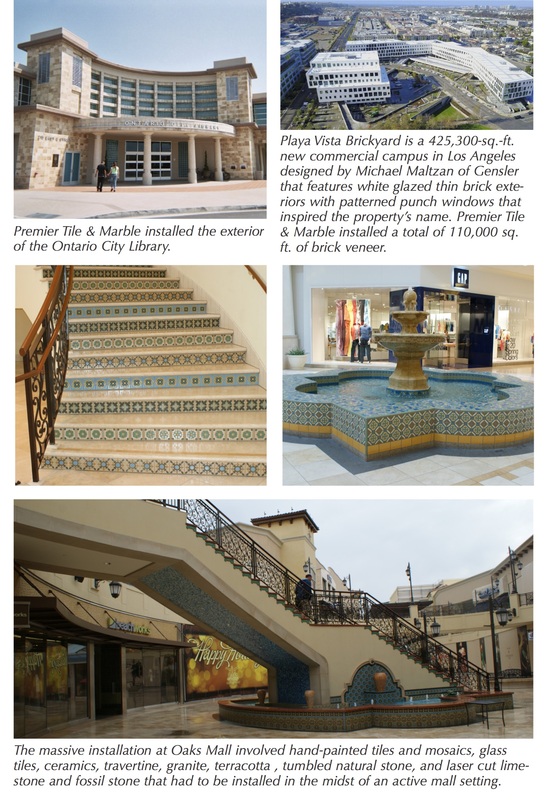 The company is proud to have played integral roles in the building of many high-profile projects such as: the award-winning Oaks Mall; The Brickhouse at Playa Vista; Disneyland; Los Angeles Football Club; USC; UCLA; Entrada at Santa Barbara; Glendale Galleria; Santa Monica Mall; Westfield Century City Mall; PetCo Park; Kodak Theater; Del Amo Mall; Kaiser Hospitals; Torrance Memorial Hospital; Great Wolf Lodge; Los Angeles International Airport; LA Federal Courthouse; Waldorf Astoria; Rady’s Children Hospital and many more. 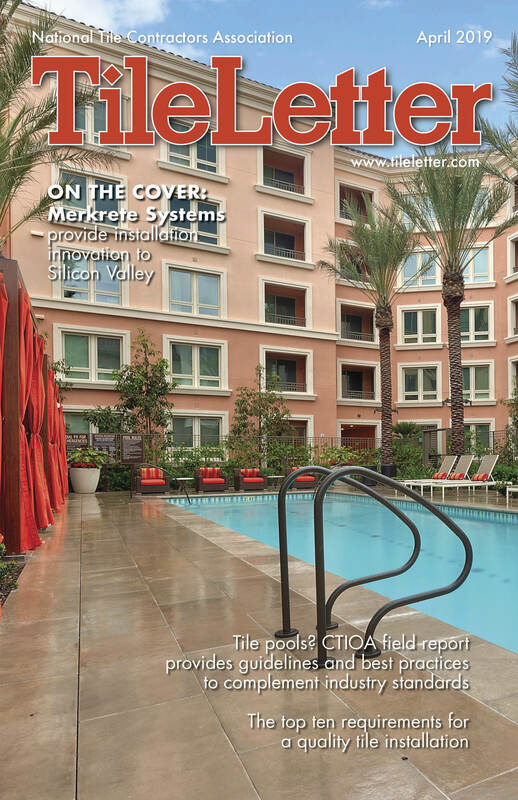 As California continues to build and grow, Premier Tile forecasts continued growth and expansion. Currently it is in negotiations with many general contractors for a variety of large and exciting projects. The evolution of products in the tile industry has opened many new avenues and Premier Tile is at the forefront of new and innovative installations, looking forward to another successful 25 years! I bet you’re thinking, “This ought to be good. What does this guy know that I haven’t already tried? Getting architects and owners to agree to pay for floor-prep work is about as easy as it is to get a concrete contractor to provide a perfectly flat and level floor in the first place.” And the answer to this question could very well be “You just read it.” He who pours the concrete that does not meet the specs should fix the floor so that it does meet the specs or pay someone else – like you – to fix it for him. Sound simple? It’s not. The problem is getting the concrete guy to meet whose specs; his Division 3 specs or our Division 9 specs? The Division 9 specs most times spell out precise finish floor requirements as if it were the tile installer’s responsibility even though he did not pour the concrete. The Division 3 specs in general do not get specific when it comes to finish floor requirements. The Tile Council of North America (TCNA) gives very definite requirements for substrate tolerances but does not spell out whose responsibility it is to provide them. We therefore have a dilemma. This sounded good to everyone except the owners who unfortunately have to foot the bill. 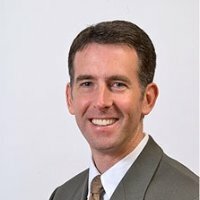 Where is the control over quality with this plan? There is none, and that is the flaw with this position. Issuing blank checks in the construction industry just doesn’t work. There is more to this issue than meets the eye, and must be considered. The floor covering industry is changing, and changing fast. With the ever-increasing demand for large-bodied tiles plus the advent of gauged porcelain slabs and panels, the demands for flat and level floors has increased dramatically. Add to this the ever-growing demand for luxury vinyl tiles (LVT) that also demand extremely flat and level floors, and it is plain to see that nearly every type of floor covering other than carpet requires a minimum of 1/8” in 10’ flatness levels. Progress is not being made along these fronts and it is not fair to anyone involved. Let me give you an example: In the spring of last year I received a frantic phone call from a good tile contractor friend of mine in Houston, Texas. He had a large ceramic and resilient tile project in progress for one of the largest building contractors in the country and was up against the wall with a substrate issue that was going nowhere toward resolution. The concrete floors were so bad that his “more than fair” estimate to repair them came to well over $100,000 and no one would listen to him. For some reason, the owner of the project was protecting the concrete contractor and would not consider paying out any money to resolve the issue. After a day of taking laser readings and laying out a complete diagram of the floor variations we were able to convince the GC that the floors were in fact, that bad. It was obviously not my friend’s fault, but the owner still would not relent. So, I advised my client to offer to sell all the tile materials that were already on site to the owner and let him find someone else to perform the install. 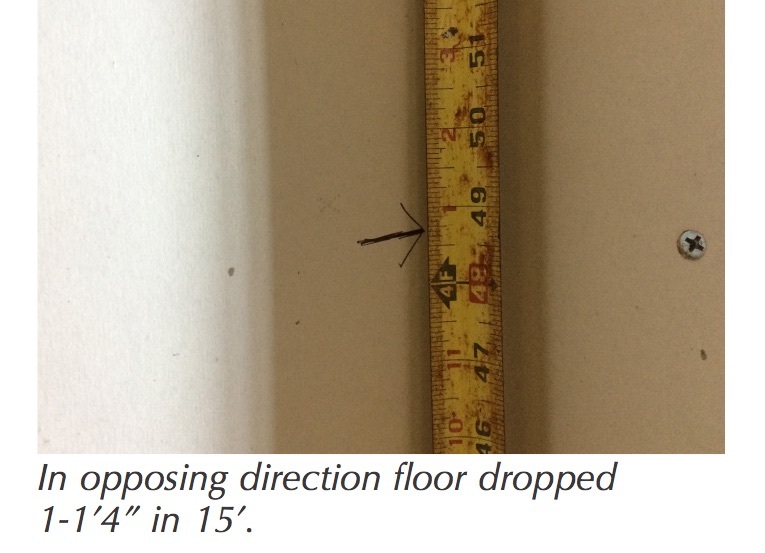 My reasoning was that my client – as a professional flooring contractor – could not in good conscience knowingly perform an inferior installation. Unless he was allowed to repair the floors and get paid to do it, he was willing to walk. The GC, by the way, respected him greatly for taking the position that he did, and the owner finally relented. The moral of the story is to stand by what you know is correct and proper. A tile contractor should never be forced to give in and fix someone else’s concrete work for free. A solution must be made. The concrete slab shall be poured 1/2” below the desired finish floor height. No fine finished trowel surface will be required. Basically a bull float and broom finish is all that is needed. This will save money in two ways. First, 1/2” less material will be used and secondly there will be no fine finish troweling labor required. This is where section 09300.5 kicks in. Just prior to beginning the tile installation, the tile contractor shall pour a 1/2” thick layer of cementitious self-leveler product over the entire floor bringing it up to the finished floor elevation that is required. Any crowns, curls, humps, or other defects in the flatness of the concrete will be rectified during this process ensuring that a perfectly flat and level floor will be provided. The specified floor covering product can then be installed in accordance with the appropriate specifications. The cost of installing the finished floor product should also be somewhat lower than normal considering that there will be no floor-prep work needed as it has already been provided for in #2 above. There is no doubt that the total cost of this system will be slightly higher because self-levelers cost more to install than poured concrete, but that cost will be known up front on bid day. And let’s face it, costs of anything on bid day are usually much lower than add-on costs for extras later on. Owners should also take into consideration that pouring large concrete slabs to a finished floor tolerance of 1/8” in ten feet is virtually impossible in the first place. There are simply too many variables during the curing and drying process to accomplish such perfection. Additional costs are a reality these days and this system will establish that total cost without confusion or cost over runs after the project is bid. Specifications for the self-leveler product need not be excessive. A good quality self-leveler will produce a 28-day compressive strength of 4,000 psi. Depth per application ranges from 1” to 2” per pour. A primer is always recommended by each manufacturer. 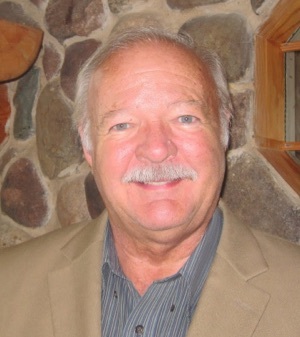 Tom Lynch is a 55-year veteran of the tile industry and one of the NTCA’s initial inductees to the “Recognized Industry Consultants” group. He can be reached at (336) 877-6951 or [email protected] or www.tomlynchconsultant.com. There are a tremendous number of benefits of being a NTCA member, not the least of which is the ability to participate in the new Members-Only Regional Training Programs touring the country right now. However, NTCA offers a number of features that even benefit non-members. Any contractor or installer can attend one of the many free NTCA Workshops or CTEF Workshops that crisscross the country, bringing information and education to local markets. TileLetter magazine is free with a membership, but it can also be accessed online for free at tileletter.com or obtained for the price of mailing for non-members. 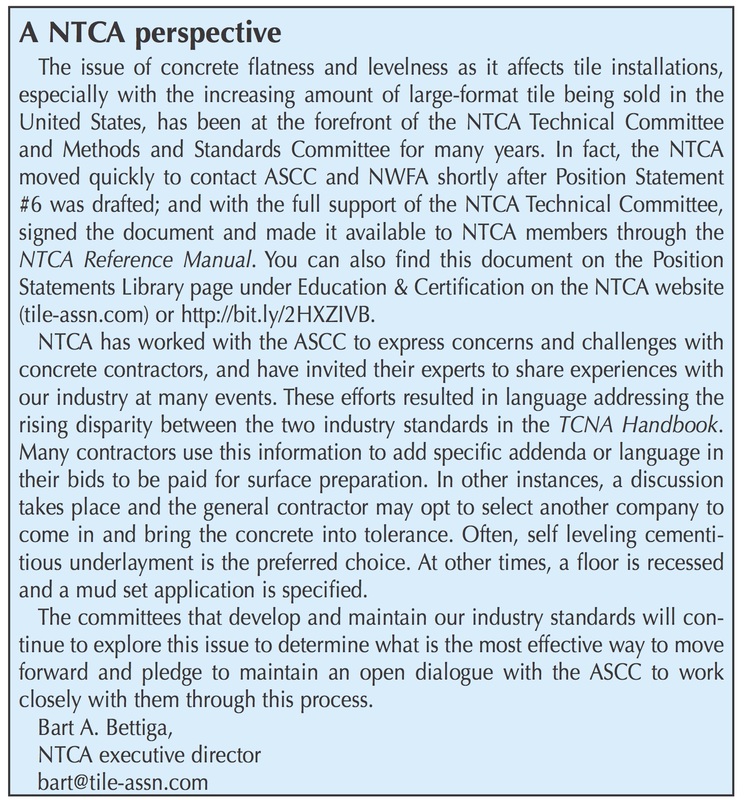 The NTCA Reference Manual, part of the triumvirate of industry documents that include the TCNA Handbook of Ceramic, Glass and Stone Tile Installation and the ANSI manual, can be obtained by clicking on the link to the NTCA Online Store, located on the tile-assn.com home page. It brings you information about many tile issues in a problem-cause-cure format, and many other important resources that add to the success of your jobs. 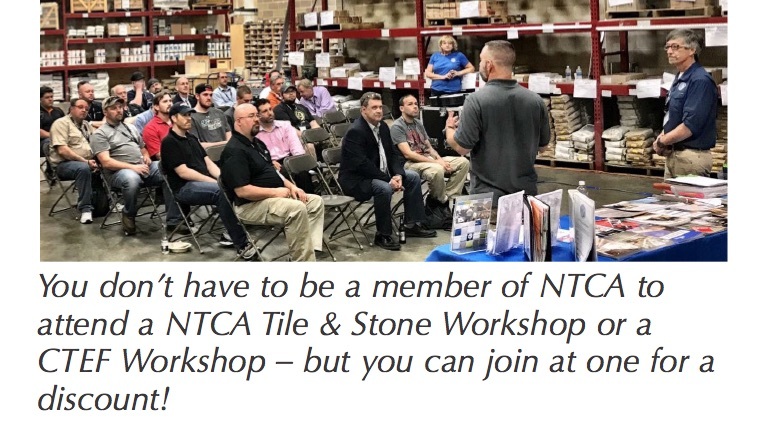 Under the Education & Certification tab on tile-assn.com, you can access other free resources – Webinars (and archived webinars about an array of pertinent topics), free educational videos through NTCA’s YouTube channel, the NTCA Position Statement library, and Question Mark videos in which NTCA Training Director Mark Heinlein answers common questions about tile installation and more. Non-members can also view our monthly TileTV video magazines at tile-assn.com website under News & Awards. For more information about all the benefits of being a member, visit www.tile-assn.com/?page=Membership. Networking, camaraderie, support, technical advice, the ability to truly shape the industry and help learn and teach industry-approved installation practices are all some of the things membership in NTCA brings. Check it out today. 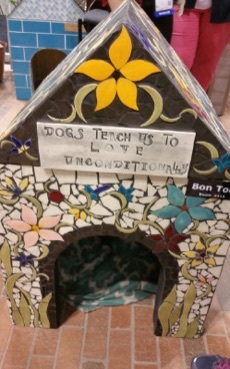 Art Tile Courtyard – Tile Council of North America Pavilion – benches, dog houses – what will be the theme for 2018? 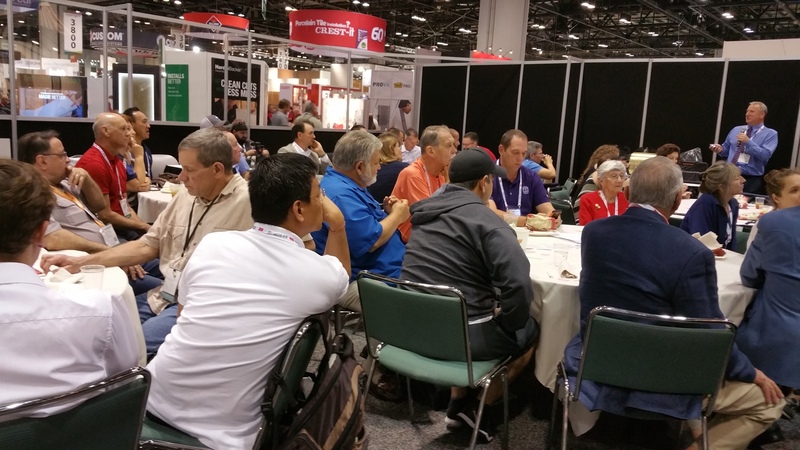 Audio Tours – self-guided tour of booths, trends, installation materials and more. Ceramic Tile Education Foundation – Stop by the booth and learn more about CTI and ACT training and industry-recognized third-party assessment of installer skill and knowledge. City of Atlanta and Coverings Student competition – come see the three public art winners created by area students. Coverings Connect – Relax, charge personal devices, and network in the Coverings Connect Lounge; enjoy 15-minute “Byte” sessions that address growth through social media and online channels. 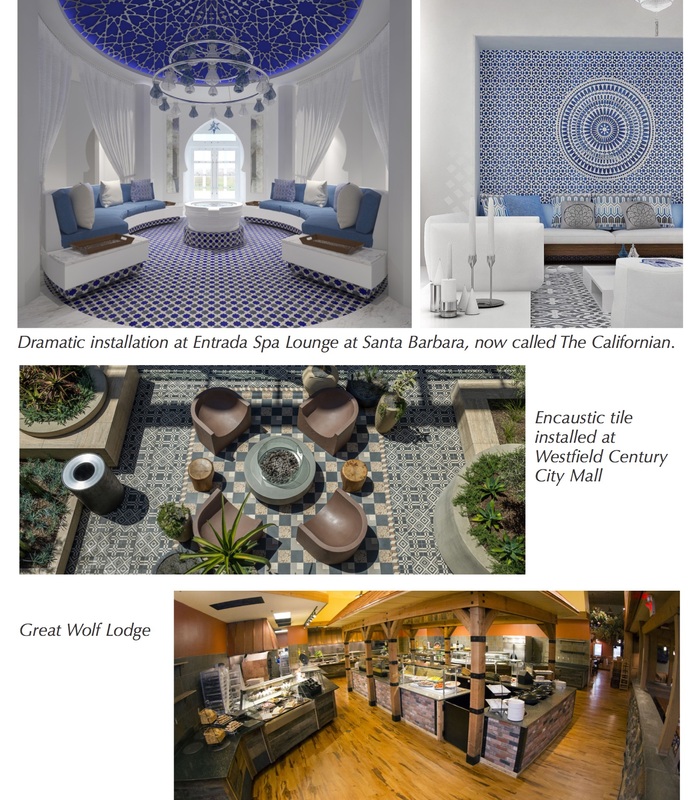 Coverings Installation & Design (CID) Awards – celebrate outstanding achievements in the design and installation of tile and stone in both residential and commercial projects. Happy Hours – Relax and network on the show floor from 3:30 pm – 5:30 p.m. Tuesday through Thursday. 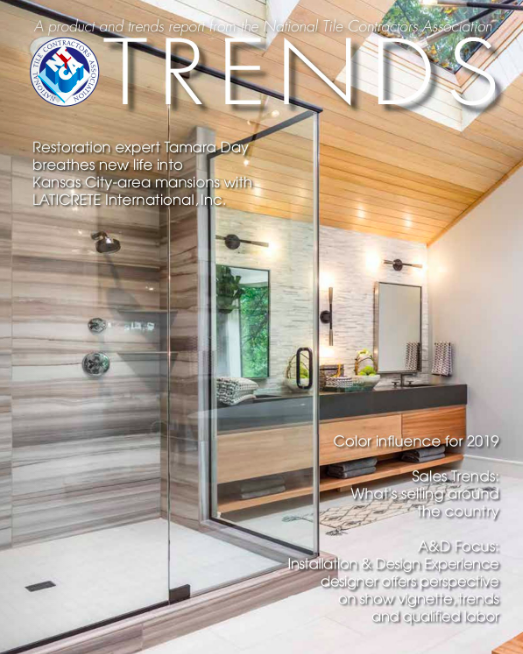 Installation Design Showcase – View the progress of the live installation of tile and stone in three tiny houses on the Coverings show floor, the result of leading designers partnering with NTCA Five Star Contractors. Mobile App – Info on Coverings is as close as your fingertips with this app. For 2018, it includes an online new product showcase and a way to coordinate meetings through your profile. Coverings Celebration – Close down Coverings 2018 with a tailgate party at the College Football Hall of Fame located next to the Georgia World Congress Center. Sports attire and favorite college football team gear are welcome! Extended Show Hours with Networking Event – Extended show hours on Tuesday, May 8 offer a chance to visit the world of tile and stone, featuring happy hour specials, musical guests and lots of fun surprises. Global Monument Hand-Print Mural – The Tile Heritage Foundation invites you to press your name, thoughts or logos into wet clay tile for the Donor Wall for Posterity at Coverings that will be installed at TCNA headquarters. $25 donation. Installation Experience (IE) – Learn about installation best practices including innovations in thin tile, tile over tile, and other tips to make your projects shine. Also as part of the IE, find out what you need to get certified. Orientation Theatre – The Orientation Theatre allows you to regroup and get all the information you need to make the most of your time at the show including answers to FAQs and tips and tricks for tackling the massive show floor. The Installation Experience – Mentioned above, this brand new event showcases the best and the worst of tile and illustrates why qualified labor makes all the difference. Visitors to the Installation Experience will have the opportunity to tour through the space, viewing tile failures – and their corresponding successes when installed by qualified craftspeople. They’ll see examples of the work of tile masters, examples of beautiful tile in bath, kitchen and fireplace installs. In addition, there’s a CTI Challenge – two teams of Certified Tile Installers will face off on a tile installation competition. Learn more about the CTI test as well as the Advanced Certifications for Tile Installers (ACT) test, and witness test demonstrations, while having the opportunity to ask questions about the exams. In addition, 30- and 60-minute training sessions offered in the nearby Contractor Lounge will prepare visitors for a full Installation Experience. 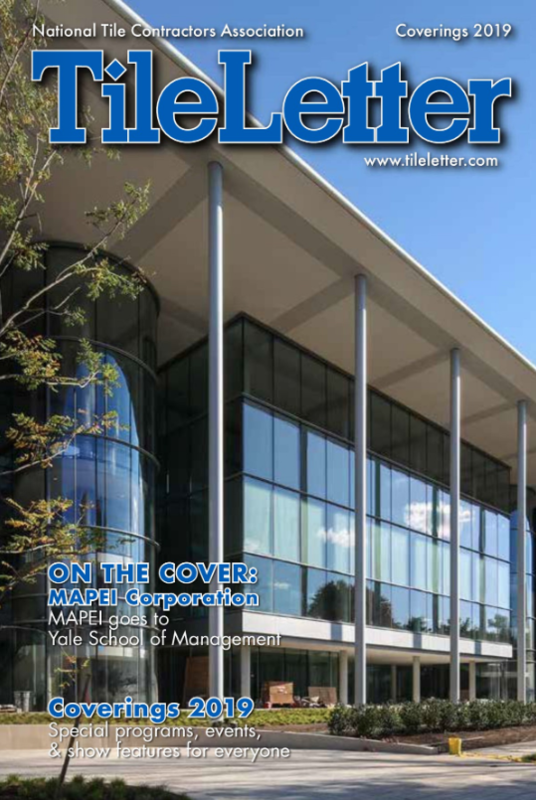 Check the TileLetter Coverings issue for more information about this exciting new feature! Town Hall Meetings – A series of Town Hall meetings will be jointly presented by NTCA and The Natural Stone Institute. They are designed to foster interactive information. 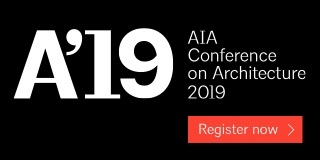 Topics will include: What General Contractors and Specifiers are Saying about the Stone & Tile Industry; General Contractor and Designer Expectations. Installation Track Seminars – This seminar series focuses on topics important to contractors. Developing our Workforce session that takes a look at attracting more installers to our industry and addressing the skills gap that inhibits the industry from finding needed talent. Why Tile – a series of short presentations are aimed at promoting the benefits of tile. For more information, visit www.coverings.com and www.tileletter.com. 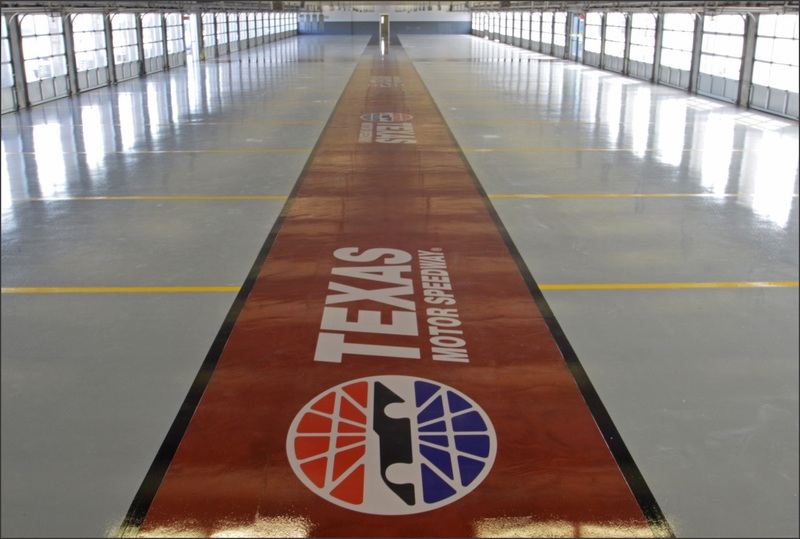 The Texas Motor SpeedwayⓇ, located in Fort Worth, Texas, is home to several popular NASCAR®events each year. With the ability to fit four Dallas Cowboys’ football stadiums inside the track, the Speedway can fit over 190,000 screaming fans and holds the largest outdoor high-definition digital display board in the country, amongst other features. 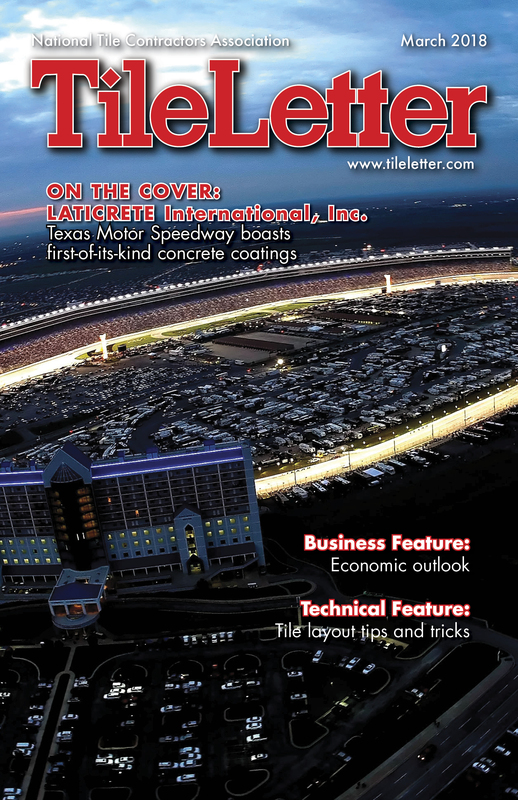 In the fall of 2016, Texas Motor Speedway management partnered with LATICRETE to bring high-performance SPARTACOTE™ concrete coating systems to the legendary raceway’s massive garages – a first at any NASCAR track. 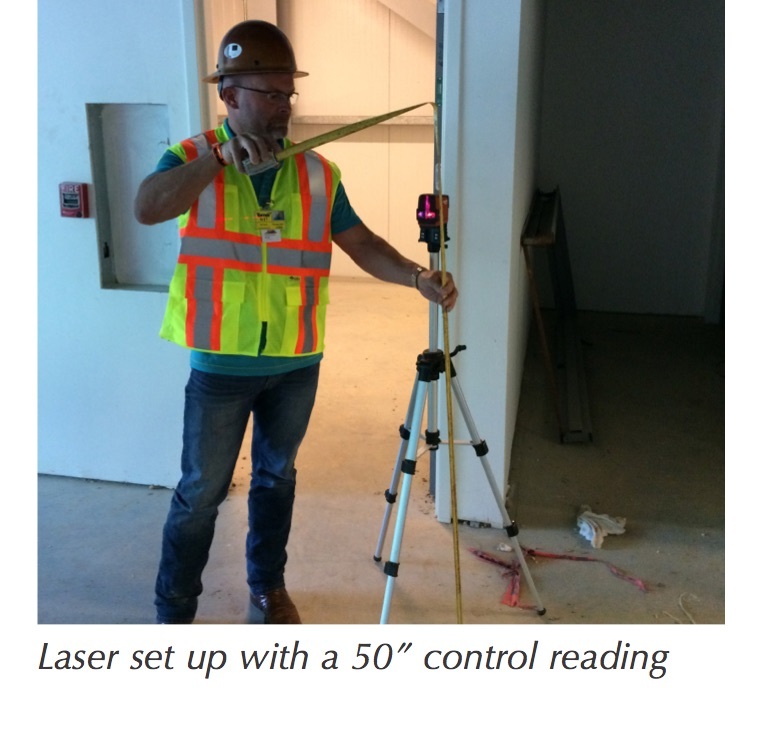 Texas-based Intertech Flooring was awarded the project as the installer due to its excellent reputation in flooring solutions and experience in specialty, high-profile projects. 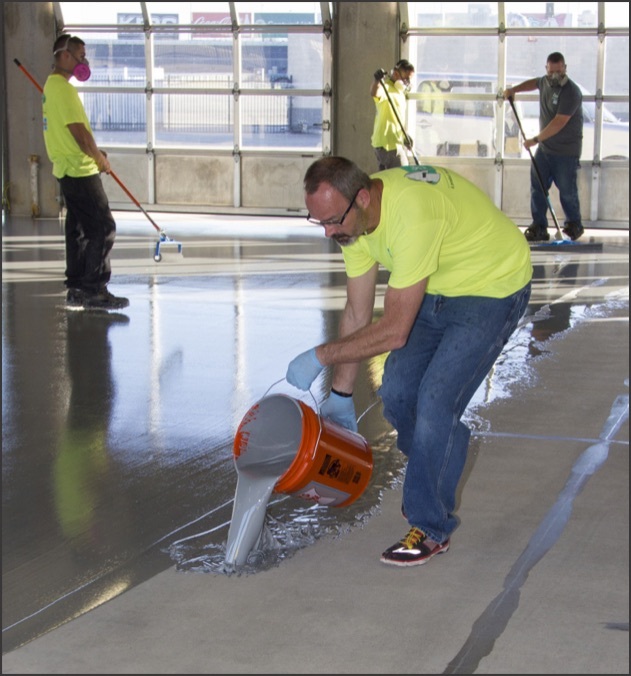 Design professionals initiated the garage floor concept, which included custom colors, textures, logos and specified a moisture-mitigation primer coat spanning the concrete surface to minimize any excess moisture found within the existing concrete slab. This type of project is increasing in popularity with tile contractors, due to the ease of install and variety that resinous flooring offers to customers as an alternative to large-format or more traditional tile or stone floors. 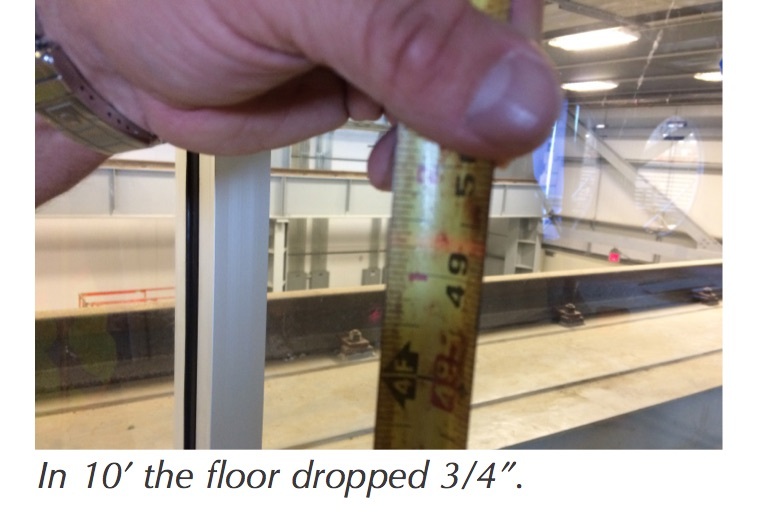 High-Profile Customization: The owners were not looking for just any old epoxy coatings as a replacement for the existing thin-film epoxy floor surface that was failing and had exceeded its service life. They demanded a professional, unique concrete coating system, which only SPARTACOTE offers. 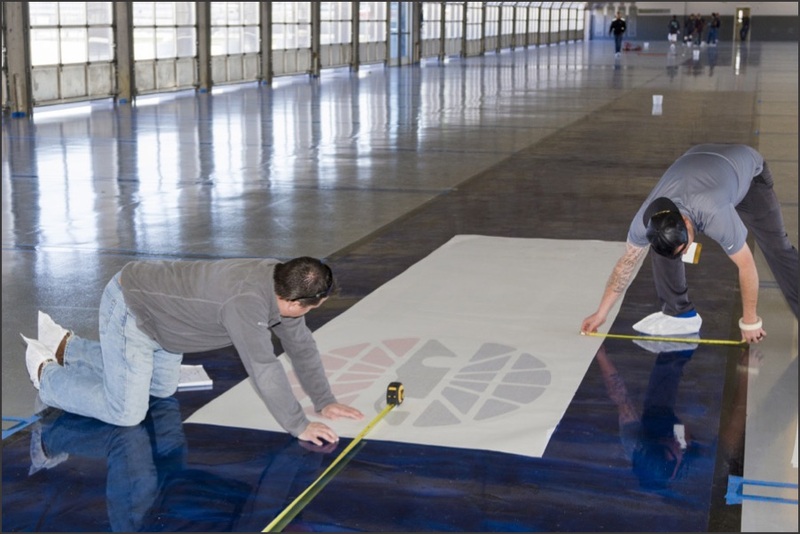 Timely Preparation: Floor preparation is often the most time-consuming part of a professional SPARTACOTE coatings project, but this is a necessary step to achieve the desired results. 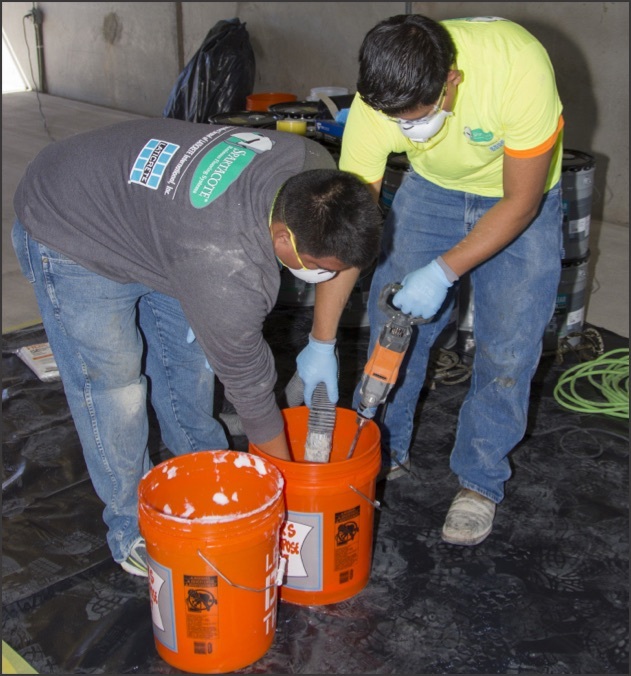 The Intertech Flooring crew mixing LATICRETE NXT Vapor Reduction Coating before application. The Intertech crew began surface preparation procedures by shot blasting and grinding the existing concrete to CSP 3 for proper adhesion. After grinding, the floor was repaired using SPARTACOTE FAST FIX™ to treat the joints and areas of the concrete that scaled and spalled. Intertech Flooring pigmented the resin of this moisture mitigator a grey color so it could act as the base-colored primer, saving the installer a step in the SPARTACOTE coatings process. the pigmented. color across all 22,000 sq. ft. (2,044 m2) of prepared concrete at 12 mils thickness and allowed it to cure for 12 hours. Applying the logo at the Texas Motor Speedway. Upon full cure, the crew buffed the surface using a swing machine with 100 grit screens and began mixing and rolling out a solid black base coat and cherry-red Metallic mid-coats of SPARTACOTE material that served as the outline for the rectangle leading to the massive, 90 ft. (27.4 m) Texas Motor Speedway logo in the middle of the garage. In phase two of the garage installation, a cobalt blue SPARTACOTE Metallic color was used instead. The mid-coats had SPARTACOTE Grip added to the coating for additional foot traction. Adding the clear SPARTACOTE topcoat to the TMS logos. 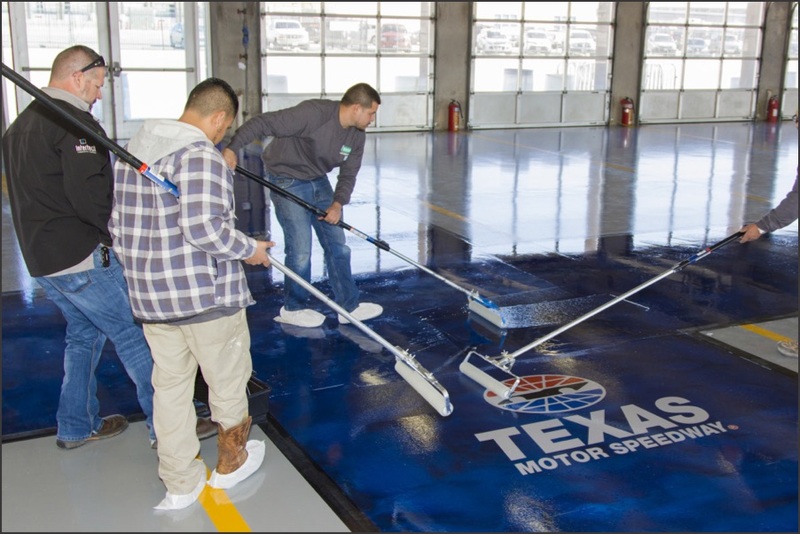 The monstrous-sized Texas Motor Speedway logo was applied over the Metallic coatings using a stencil to ensure exact placement. Once the team applied, tamped-down, and carefully removed the backing adhesive, they applied a final clear SPARTACOTE topcoat over all 22,000 sq. ft. (2,044 m2) of garage space to lock in all colors, textures and logos, and to ensure a seamless, durable finish. Designed to withstand aircraft hydraulic grade oils, such as Skydrol®, SPARTACOTE coatings are resistant to other common garage chemicals and three times more abrasion resistant than traditional epoxy. 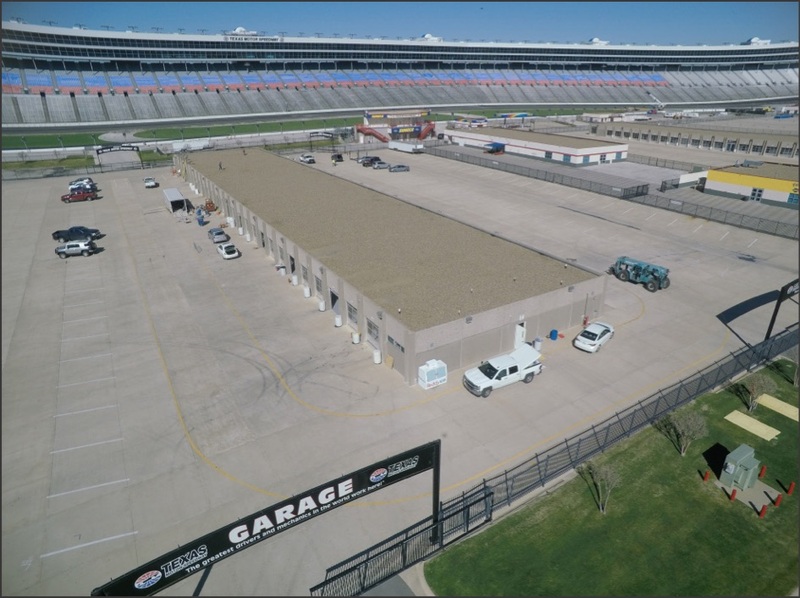 The Intertech team completed and turned over Phase 1 of the Texas Motor Speedway north commercial garage project in October 2016 in time for the Texas 500 NASCAR event in November. Phase two in the south race car garages was completed in February 2017. Metallic cobalt blue TMS logo completed. Completed cherry-red metallic logo at TMS. Phase 1 of the 22,000-sq.-ft. project is complete, along with custom logo. 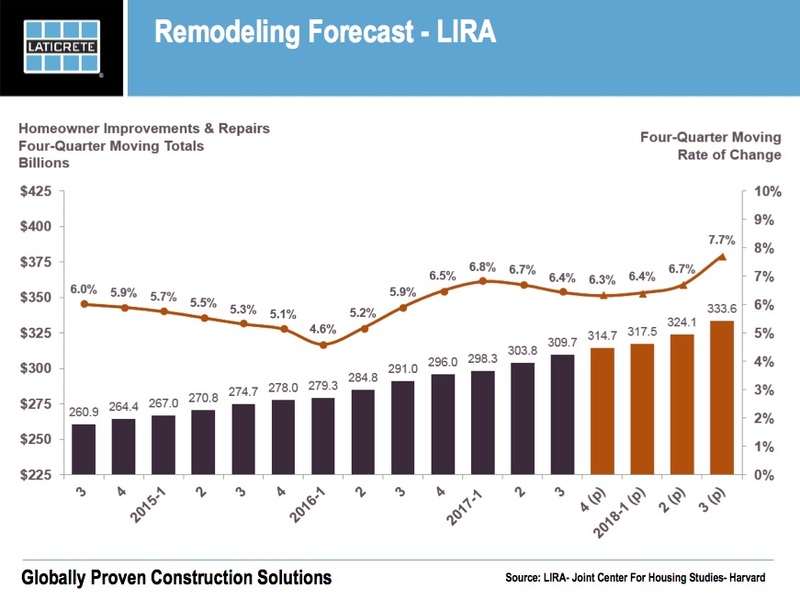 The article below provides a brief high-level summary of the construction outlook for both the residential and commercial markets, including an estimate of tile consumption for 2018. Residential new and remodeling construction plays a significant role in tile consumption and is a key barometer to the overall economy. Over the past several years, the residential market has continued to climb out of the trough from the recession, and has shown growth throughout 2017. Home values increased again in 2017 while existing home inventory remained at normal levels. Overall, residential growth looks forward to continued expansion in 2018. New Housing starts – 2017 total new housing starts increased overall only around 3% over 2016. Single-family starts were relatively healthy, increasing over 2016 by almost 9%, however multi-family construction dragged the overall category down – starts for multi-family were down close to 8% after some high growth years in 2014 and 2015 resulting in overbuilding for the segment. For 2018, new total housing starts are projected to only increase close to 3% again, with single-family up only around 5% and multi-family slightly down versus last year. Total units again will hover around 1.3M. The impact from the Tax Cuts and Jobs Act signed into law recently will most likely dampen housing activity in very high home value markets ($1M or greater homes). However, it will not impact the majority of U.S. home owners, since they are still able to deduct interest payments on mortgage debt up to $750,000 which includes new mortgages or improvements made from December 17 through 2026. Residential Remodeling – Remodeling is the other and larger side of the residential market place and has performed nicely throughout 2017 and is forecasted to lead again in 2018. The housing industry continues to benefit from robust sales of existing homes and is running at historic lows of inventory. According to many construction indicators, there is widespread agreement that residential remodeling spending will increase in 2018 versus 2017, at a mid- to high-single digit rate. 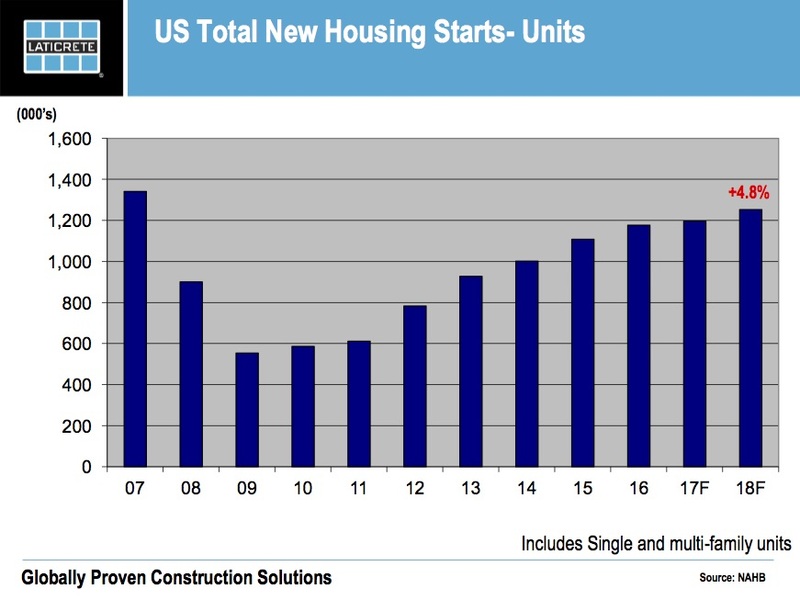 Residential remodeling continues to benefit from factors impacting new housing starts. As with the last several years, Millennials are remaining at home longer, and older individuals are choosing to remain at home or “age in place.” This will spur home remodeling and will continue to result in solid growth again in 2018 with bathrooms, kitchens and in-law room additions driving remodeling activity. Rising home values and continued low interest rates are allowing homeowners to take out home-equity loans for the remodeling project. This is driving demand across all aspects of construction – especially for new tile or stone flooring! Overall, we forecast the residential market to account for close to 60% of all tile consumption in the U.S. in 2018. It will drive growth for flooring, with kitchens and bathrooms as the main project types. The new tax law mentioned above will however bring down a percentage of remodeling spending on very expensive homes – as deductions on interest will be capped – but overall the segment will be strong in 2018. We forecast the commercial construction segment to experience steady growth in 2018, between 3% and 5% in new square footage over 2017. The commercial segment is being aided by a continued easing of lending standards that allow for more of the much-needed financing for large projects, combined with an increase in demand for commercial lending. Whereas the Tax Cuts and Jobs Act may lessen housing activity in very high-end home markets, the impact of the law is favorable for commercial construction due to reduced corporate tax rates, thus providing an incentive for investment. In addition, favorable commercial lending policies and recent survey results among architects show an increase in demand for services, so the environment is very favorable for expansion. Looking within the commercial segment, low single-digit growth is basically forecast across most verticals with education and office building activity leading the way. All regions across the U.S. – except the North East – are poised for growth, with starts in the South Central and Mid-West states forecast to have the largest percentage of growth when looking at value of total starts. As previously mentioned, 2017 residential construction experienced another solid year of growth for new and remodeling activity, and commercial construction increased modestly in terms of square footage. Based on this, we believe tile and stone combined consumption will increase to ~ 3.5 billion square feet in 2017, an increase around 4%. Based upon the above-forecasted growth in each market for 2018, we can segment the ceramic tile and stone industry accordingly, and calculate the respective share in square footage of each segment with applicable growth percentages based upon the 2018 outlook. A conservative estimate range for 2018 indicates combined tile and stone consumption growth of between 4% and 6% to approximately 3.7 billion square feet. 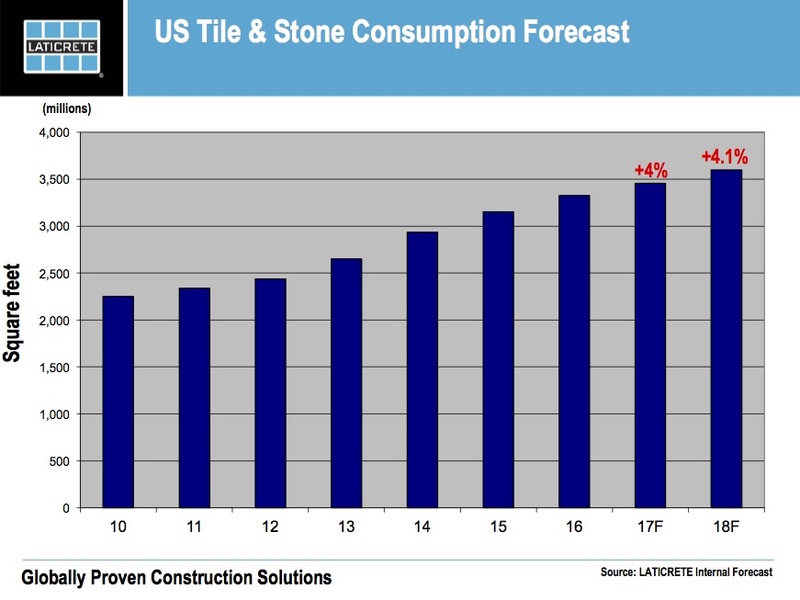 Tile and stone consumption estimates are naturally subject to all the macro-economic and subsequent construction market risks as well. The recent tax law – coupled with a charged political environment – plus a myriad of changes in key markets around the world can instantly impact forecasts. As with last year, all of the major institutions that track and forecast construction activity are projecting growth for 2018 at various rates. It is that consensus which makes us confident that we are looking forward to an exciting 2018, and continued growth of ceramic tile and stone!